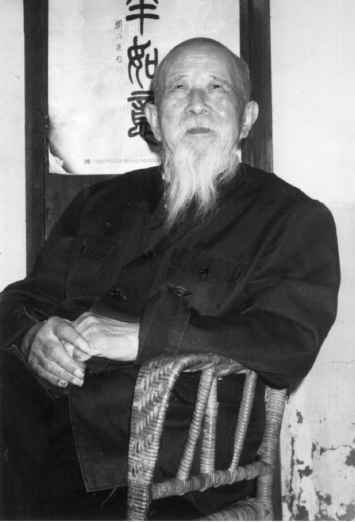 In his later years, Li Zi Ming wrote a number of books and magazine articles in order to help promote Ba Gua Zhang for health maintenance and self-defense. In the following article, Li talks about the health benefits of walking the circle. It is interesting to note that in this article Li calls the circle walking practice "Ba Gua Zhang Qi Gong." As Vince Black mentioned in the last article, Li thought that the practice of the Ba Gua system itself was sufficient to develop the skills that supplemental qi gong practice might develop. Many of the older generation Ba Gua practitioners in China felt the same way as Li felt, that the qi gong and nei gong of Ba Gua was all contained in the circle walk practice. Preventive Medicine and Sports Therapy have existed for a long time in China and have been handed down continuously and spread widely from ancient times. Starting in my childhood, I have practiced this art for over seventy years and have benefited deeply. Although I am at the advanced age of over eighty, I am still vigorous and healthy. For the development of the Ba Gua Zhang, I offer serious instruction and enthusiastic guidance to students and practitioners at home and abroad. For the purpose of combining the practice method of qi gong with medical life-preservation therapy and to promote the coordination of the aspects of the prevention and treatment of diseases, the cultivation of character and internal visualization, I offer my instruction. Great achievements have been obtained and deeply appreciated by practitioners at home and abroad. For many years, I have been in charge of the Ba Gua Zhang Association and have traveled at home and abroad to offer this great art in order to propagate the Chinese martial arts. It is necessary to understand that the qi gong of Ba Gua Zhang belongs to the internal schools of boxing and that one of the key points of practice in the internal schools is that the tongue touches the upper palate to link the Conception Vessel and Governor Vessel. The Conception Vessel is the "sea of the yin meridians" and dominates the yin meridians in the body; the Governor Vessel is the "sea of the yang meridians" and governs the yang meridians of the body. Touching the tongue to the upper palate is "to build a bridge" between the Conception Vessel and Governor Vessel and link them together. As soon as the Conception Vessel and Governor Vessel are linked, the "hundred meridians" can be linked. Once the "hundred meridians" are linked, disease will not occur. The practice method of Ba Gua Zhang Qi Gong emphasizes walking in a circle, the clockwise and counterclockwise motions of which are the fundamental basis of the practice method. In Ba Gua Zhang it is said that "walking is the master of one hundred practice sessions," and "a hundred practice sessions without circle walking is no better than walking just once." Motion brings nimbleness, motionlessness causes stagnation. During the practice, it is required to walk the circle in accordance with the body's condition. Those with a weak body constitution and sickness are advised to walk slowly in a comparatively big circle and with the body lowered only a little bit. It is also required to have both clockwise and counterclockwise walking, which will be beneficial to the mutual production of yin and yang. Thus, the beginners will not be in fatigue. 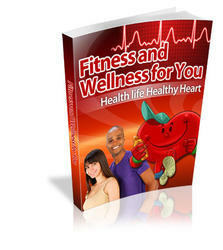 Generally, it is advisable to walk naturally and progressively and not to hold the breathing. Do not use awkward force. If the practice is done according to the correct principles for a long period of time, it is possible to obtain a better effect. The view point is one of "cultivating the interior and exterior," which is mainly to exercise the interior for the purpose of preventing disease while also strengthening the body (exterior). This idea is based on traditional Daoist principles and the skill method of Dong Hai Chuan, the originator of Ba Gua Zhang. In the Nei Jing, the understanding of qi is comparatively systematical. The chapter "Plain Questions" states: "The human develops from the qi of the heaven and earth, " and "Life is called the human being when the qi of heaven and earth is joined." Qi is the essential substance required for the formation of the human body and the maintenance of life activities of the human body. The Nan Jing (Classic of Difficult Issues) says: "Qi is the foundation of the human, and if the root is eradicated, the leaves will decay." Here is the difference between the yuan (primary) qi and the zong (essential) qi. The yuan qi was seen earliest in the Nan Jing, which states: "The gate of life (mingmen) is the house of the spirit and essence and the gathering site of the yuan qi as well." The yuan qi is obtained from innateness, stored in the kidneys, and supplemented and nourished by the zong qi. The zong qi is produced jointly by the acquired qi of grain and water combined with the inhaled clear air of the natural world. In order to have a healthy and strong body constitution, it is necessary to strengthen the body constitution by exercise so that the yuan qi can be continuously supplemented to promote the physiological functions of the zang-fu organs and meridians, to promote water metabolism and blood circulation, and to increase the ability for the prevention of disease, hence to prolong life. This method is one of tranquility within motion, motion within tranquility - tranquility in the upper and motion in the lower. That "the motion produces yang and the tranquility produces yin" is the viewpoint of the ancients. But Ba Gua Zhang Qi Gong adopts a specific method of movement. This method is one of tranquility within motion, motion within tranquility - tranquility in the upper and motion in the lower. I think that in this way we are able to practice the internal skill and also practice the external skill so as to harmonize them. In simply practicing the tranquility skill we can easily cause the physical body to become weak and likewise, the simple practice of motion skill, without paying attention to the inside, can result in an insufficiency of the internal qi. Therefore, to practice qi in the interior and practice the four limbs in the exterior, plus the attacking art of the boxing set of Ba Gua Zhang, we can make a perfect balance. I can recall one thing which happened over twenty years ago. There was a patient sick with pulmonary tuberculosis in the later stage and the hospital told his family to prepare the funeral affairs for him. Afterwards, the patient was introduced to me. On one hand, I persuaded him to take the medicine he was prescribed by the hospital, and on the other hand, I taught him Ba Gua Zhang circle walking exercise. After he walked the circle for less than a half year, his disease decreased fifty percent. After he practiced for one year, his body weight was increased and his disease disappeared. At present, his is over seventy and instructs a number of students. The example fully explains that the Ba Gua Zhang Qi Gong can play a role to arouse the yuan qi of the human body and to strengthen the body constitution and expel the pathogenic factors in the treatment of disease that medicine alone cannot do. The ancient medical sages did not advocate to treat diseases after their onset, but suggested to prevent disease before its onset. I think that the motion of the celestial bodies in the universe cannot leave rotation and circulation. This has been confirmed by the modern science. The planets and stars can never leave the rotation. Therefore, the theory of the ba gua adopted the natural forms and created the walking and rotating skills of Ba Gua Zhang. The human body is a small heavenly circle. To move qi, to guide, to exhale the stale and inhale the fresh, to circulate qi with the imagination and to move the body with qi are exactly the mysterious methods for life preservation, especially the cultivation of the interior and exterior - to practice qi internally and to practice the force externally. The qi is the force, and the force is the qi. I stress that the tongue touches the upper palate to link the Conception Vessel and Governor Vessel because this connection promotes the circulation of qi and strengthens the area of the dan tian. 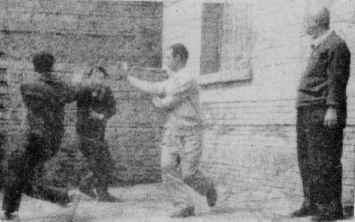 In other kinds of boxing skills in the martial arts, circular movements are also highly stressed, such as the ball embracing movement in Tai Ji Quan. The Ba Gua Zhang Qi Gong is one kind of movement which conforms to natural principles and, with the rotational movements and the clockwise and counterclockwise circular motions as the fundamental rule there is an obvious effect in the producing and arousing qi inside the body and a strengthening of the body's constitution. With painstaking study and practice, it is possible to obtain qi for strengthening the body quickly. Ba Gua Zhang Qi Gong exists objectively and has a material basis. 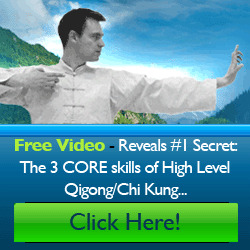 Ba Gua Zhang Qi Gong is not secret. By practice over a long period of time, it is possible to obtain satisfactory results. The ancient medical sages did not advocate to treat diseases after their onset, but suggested to prevent disease before its onset. Ba Gua Zhang is has as its aim the strengthening of the body by movement of the hands, feet, waist and four limbs, which is important to improve circulation and prevent cardiovascular problems. It also effectively improves the respiratory system and digestive system, as have been pointed out by modern medicine. I have a school brother. He was honest and did not speak much. He did not learn very many boxing sets and methods. But he walked the circle his whole life. As a result, his skill was excellent and other martial arts practitioners could not get close to his body when fighting with him. The reason is that his thought was pure and he mastered the skill of circle walking and obtained powerful strength. What strength is it? I think it is mainly the arousal of qi which can strengthen the body and safeguard the body by the unity of qi and force. This kind of unity cannot be defeated simply by the seizing and grasping skills of the martial arts. This is the commonly mentioned principle "to practice the qi internally and to practice the tendon, bone and skin externally." Ba Gua Zhang Qi Gong is identical to the theory of life preservation in Chinese medicine and is practical for healthcare, and prevention and treatment of disease. At present, the chemical medicines are used widely and bring about many side effects. The important role of sports therapy has been understood. Therefore, it is very urgent to popularize the traditional martial arts for the benefit of the people.